Want natural stone flooring with irregular pieces like the styles you’ve seen in Better Homes & Gardens? Having stone flooring shouldn’t break the bank and with all kinds of ways to have the best looks in stone flooring for indoor and outdoor spaces, use these tips and secrets from expert designers and floor installers to get the perfect look. Having natural stone flooring or vinyl tile that resembles natural stones is easy to achieve, and any flooring specialist can help. The Spruce highlights that natural stone is ideal in certain areas and it’s not best for damp environments. Made from sedimentary materials, limestone can be sanded for a refined look. It’s popular for its earthen look and is often used in kitchens, bathrooms, and outdoor walkways. While color options are limited to gray, tan and white, Build Direct states when it’s used for bathroom floors, it should be sealed every few years to protect the porous material. Tip: When you contact a flooring store about their natural stone flooring sale and installation price, ask for a senior discount which is $100 off, and ask about sealant for your limestone flooring to protect it. Used for more formal spaces, while lovely, marble can be scratched. It’s a porous stone that comes in many varieties. Better Homes and Gardens states, there are different versions, some more durable than others. Tip: When you request a price for flooring and installation, ask the flooring specialist about having the marble sealed or consider vinyl tiles that resemble marble and are much cheaper. Popular for bathrooms because it comes in irregular shapes and different colors, the slate is a metamorphic rock with a fine-grain. It’s slip-resistant, handles heat well, and is warm underfoot, which is why it’s popular in bathrooms. Tip: Because slate can increase your property value, but is more expensive, look for deals like $500 off new stone flooring and ask for free-installation. 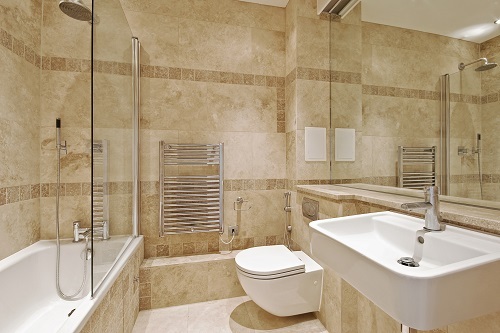 Build Direct states that travertine is a top bathroom flooring option that confused with marble. It’s a crystallized type of limestone that is metamorphosed. It’s actually formed in hot springs and is very porous and soft. It’s used for bathrooms and kitchens. Tip: To ensure its longevity, this stone should be sealed. Take advantage of end-of-season sales or the $693 off in-stock flooring. There are hundreds of kinds of granite that can be used in kitchens or in bathrooms. To ensure the texture is slip-resistant, the stone is flamed or sand-blasted. With sand-blasting, high-pressure silica sand is added to the stone’s surface with an air gun to create a granular finish. It’s one of the most popular types of stone and often the most expensive. Tip: Because this type of stone will increase your home’s value, shop during a holiday sale when it’s marked down or ask for special financing. Natural stone flooring can range from $2 per square foot up to $100 per square foot depending on the type. It has several benefits that include each piece is uniquely designed, it offers a natural look, and it’s eco-friendly especially if you have locally cut natural stone flooring installed. With this type of mountain-born flooring, it does come with a few drawbacks that include it can easily chip or be scratched. When you shop for new flooring, you’ll want to ask for a Grade 1 or Grade 2 which offer a higher quality over a Grade 3. To manage the upkeep with your natural stone flooring, it may need to be treated to protect it and reseal it. If left untreated, it might suffer under wear-and-tear if you have pets or children as certain stones can be prone to scratching. To help you save money on flooring if you don’t want to go with natural stone, use vinyl flooring instead. With vinyl flooring, you can achieve the same stone look, and it’s a lot cheaper. As far as the maintenance and benefits, vinyl flooring is easy to install and it’s durable so it will hold up with high foot-traffic. Vinyl flooring can be installed in a few hours, it’s easy to clean with a damp mop or Swiffer, and you don’t have to have it resealed in a few years. Vinyl flooring ranges in price from $1 to $5 per square foot, while luxury vinyl tile can run from $8 up to $25 or higher per square foot. Ready to order natural stone flooring or vinyl tiles? You can find your flooring by doing a search on Google for “carpet stores near me that sell stone flooring” or “flooring stores near me.” When you call, ask about the latest flooring sale and installation deal, the types of natural flooring options and vinyl flooring that resembles stone. Don’t forget to ask for free-installation and any end-of-season discounts you can take advantage of. Looking for a flooring sale and installation quote? For a fast flooring sale and installation estimate, Express Flooring sells all kinds of carpeting, hardwood flooring, tile flooring, and discount flooring. Arizona residents can take advantage of flooring sale and installation deal specials like next-day delivery and free installation. Contact Express Flooring today! This entry was posted in Flooring, Stone Flooring and tagged Benefits of Stone Flooring, Stone Flooring, Types of Stone Flooring on November 23, 2018 by Express Flooring.